Raksha Bandan is the celebration among brothers and sisters. The sister normally ties a Raakhi on the right wrist of her brother for protection. In return, the brothers normally give presents their sisters. This tradition has taken place since ancient times when there was a battle between gods and demons. The Bhavishya Puran tells us of a great battle between Lord Indra and the demons. The gods were all concerned and depressed in the battle for righteousness. Sachi (the wife of Lord Indra) took a thread and recited sacred mantras over it for protection. She then tied it on the right wrist of her husband. It is believed that this enabled Lord Indra to conquer the demons in this battle. Ever since this victory of good over evil, this tradition has taken birth. As time progressed, modification has been made to this festival. Sisters tie the sacred thread (known as a Raakhi or Raksha) on the wrist of their brothers. The pundits (Hindu Priests) tie them on the wrist of the devotee. 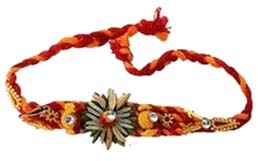 During the middle ages, if a woman tied a Rakhi on the hand of any man, then it became imperative for him, as his religious duty of the highest order, to protect that woman. That man would put his life at stake to protect the honor of that woman. Tena tvang prati-bad-raani, Raksha maa chala maa chalaa. May this sacred thread protect you from all demons and help you to conquer them in the same manner as Lord Indra conquered the demons.